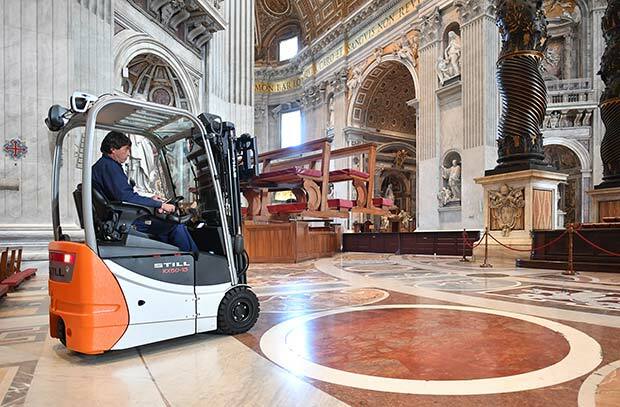 Silently, the STILL RX 50 forklift truck enters St Peter’s Basilica through a side entrance – it almost seems to glide across the opulent marble floors. On its way, it passes works of art and tombs, including that of Pope Alexander VII, which dates back to the 17th century. The sight of a STILL forklift truck in one of the world’s most famous churches still comes as a surprise to many. After all, the heavy, bright orange truck does stand out from all the splendor around it. But recently, this has become a more familiar sight, as the truck’s driver, Giovanni, works for the Reverendae Fabrica Sancti Petri, the Fabbrica di San Pietro, also known as the Fabric of St Peter’s. Founded in 1908, it is responsible for the preservation and decoration of the world’s most important Catholic church. The decision to go for this STILL model was an easy one. 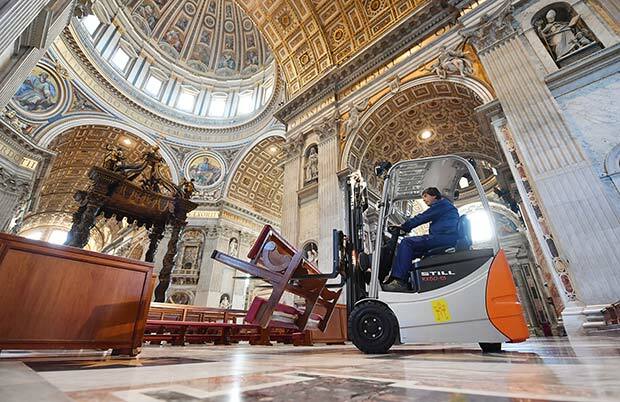 The Vatican has been using STILL trucks for some time, according to Loreno Leri, Head of Marketing at STILL Italy, but only outside in St Peter’s Square, where they are deployed to help with the setting up of seating for general audiences, for example. The rooms inside, however, are exclusively the responsibility of the Fabbrica, and the challenges of protecting the many precious objects and works of art within lead to different requirements. The truck can often be found bustling about between the bronze baldachin, which rises twenty meters above St Peter’s tomb and points up to Michelangelo’s dome, and the Cathedra Petri, the Chair of St Peter in the main apse. This is where many liturgical festivities and masses take place, for example at Easter and Christmas, and a lot of seating needs to be set up here and in the cathedral’s main nave. This is just the task for the STILL forklift truck. It picks up the benches with its fork and transports them to wherever they are needed, without leaving any marks on the marble floor or disturbing the peace of the visitors or the popes in their tombs. When the truck is in reverse, a small cone of blue light warns anyone nearby. Giovanni is certainly delighted with his ‘loyal helper’, which can even move confessionals from one corner to another if required. When the truck is not needed inside, it is sometimes used in the grounds around St Peter’s Basilica to transport building material to where the old edifice is being repaired. But the STILL truck’s main territory remains inside the church, where its agility and energy efficiency are a major plus. As Loreno Leri explains, these were exactly the features that convinced the Fabbrica to choose this truck. “STILL’s popularity and leading position on the forklift truck market is based on the safety of its trucks, their ease of use, and the precision with which they can be maneuvered in space.” Even when that space is sacred, of course. STILL offers customized intralogistics solutions, and implements the intelligent teamwork of forklift trucks and warehouse technology, software and services. The achievement created by the Company’s founder Hans Still in 1920 through a large amount of creativity, entrepreneurial spirit and quality quickly developed into a strong brand well-known throughout the world. Today around 8,000 qualified staff in research and development, production, marketing and service are involved for the sole purpose of fulfilling customers’ needs throughout the whole world. The keys to the company’s success are highly efficient products ranging from sector-specific complete offers for large and small enterprises to computerassisted logistics programs for efficient warehouse and materials flow management.